I did make an interesting discovery today: http://airportcoffeeshop.blogspot.ca/. This came to my attention via academia.edu when I noticed someone found my page from the blog. After glancing through the blog, there are some very interesting aviation links, and a great way to keep updated on the goings on at GIAA. 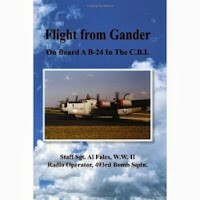 I picked up Flight From Gander: On Board A B-24 in the C.B.I. by Staff Sgt. 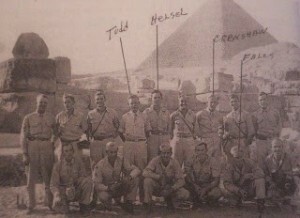 Al Fales, WWII Radio Operator, 493rd Bomb Sqdn. primarily based on the title. Without reading anything but Flight From Gander, I thought the book would be about Gander, Newfoundland. Turns out, Michigan was also (still is?) referred to as Michigander, and because that is where Fales and his crew initially flew out of, the book is called Flight From Gander. But, all is not lost when it comes to it being a resource for Newfoundland aviation history. Fales and his crew did fly from Gander to the Azores on their way to overseas. Fales describes Gander is “colder than Scrooges [sic] heart” and learned what they needed cold weather gear for as they landed on the ice and snow covered runways. They were actually delayed for two days due to the runways being too slippery after a cold weather system moved through. While waiting, Fales enjoyed the high calorie meals provided, and between those and the winter suits, were quite comfortable during their stay. 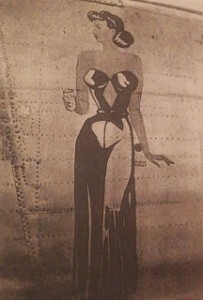 Fales talks about how many aircraft were decorated with images of their women back home. Fales 2007. Most interestingly is how Fales remembers the little details. To leave Gander, the engines had to be heated because the cold weather would make the oil in the radials of the engine slow and difficult to pour. Trying to use the engines in that state would make them stiff, overheat the starters and drag on the batteries. So, big fan forced oil heaters were used and long flexible ducts were used to warm the engines enough that they would start. They were heated for about a half hour, then they started each engine in turn, giving each one time to cough, sputter, and “belching smoke like a cold diesel engine” before “settling into a smooth rumble”. 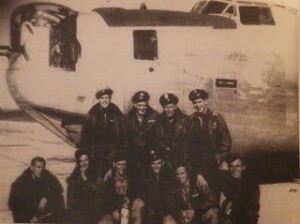 The propellers “fanned a cloud of snow across the field as the engines were run up” and once they were at full power, the B-24 took off from Gander. Fales and others on their way home. Fales 2007. This is just an example of the detail used by Fales in his book. He tends to focus on what would typically be considered the mundane; the food, the Postal Exchange, his crew mates, and people that he met when out on pass. Fales’ book a great look into the lives of servicemen in the USAAF and focuses the day-to-day operations and activities, something which is often lacking in memoirs. While I was disappointed in the lack of talk about Newfoundland (especially when I was expecting the book to focus on Gander, Newfoundland), Flight from Gander is still a great source to know what the lives of those passing through Gander were like. Certainly there would be big differences between being stationed in in US or overseas than in Gander, mostly because Gander was so isolated and passes to go to Grand Falls or Corner Brook were less frequent than passes to go into “town” when stationed somewhere a little closer to the nearest community. One thing in the book that I do need to research further is a reference near the end of the book (and the end of the war) of an experimental flight the author was involved with. Well, the flight wasn’t experimental, but the radar on the aircraft was. The aircraft looked a little different, with the bottom turret removed and a “cream colored plastic tub that could be raised and lowered” in its place. It was a special radar that they were to use along the coast of Burma which proved that radar could be mobile and effective. I would need to do more research, but the first site I worked on in Gander involved a USAAF B-24 which was carrying a top secret radar and the aircraft carrying it were designated “Eagle”. Unfortunately, as I worked on this one, it did end tragically, with a crash at it was flying into Gander on 14 February 1945, killing all 10 men on board. When I look into it a little more I will see if I can figure out if this is the same radar system. 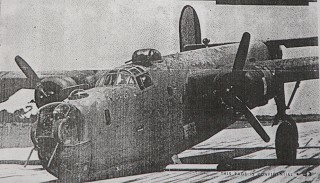 An image of a B-24 carrying the radar system. On this image, you can see a long beam under the aircraft. This was one portion of the radar. From Masters 1945. 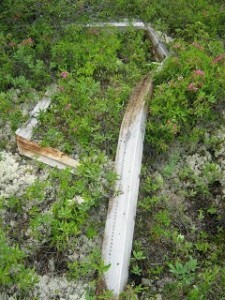 Part of the APQ-7 radar system found in Gander, Newfoundland. Photo by Lisa M. Daly. Flight From Gander: On Board a B-24 In The C.B.I. Xlibris: USA. 1945 The Eagle Strikes. It Paid Off at War’s End. RADAR (11):36-45.